Natural England has issued a licence to allow the release of white-tailed eagles on the Isle of Wight. The release is part of a project, led by the Roy Dennis Wildlife Foundation and Forestry England, to establish a breeding population of white-tailed eagles in southern England. White-tailed eagles became extinct as a breeding species in England in the eighteenth century. Releases over the past 40 years have successfully re-established breeding populations in Scotland and Ireland. Natural England has very carefully considered all aspects of the licence application. I would like to personally thank the expert working group of local staff and national specialists who have carefully tested the application against our licensing criteria and the IUCN: International Union for Conservation of Nature's Guidelines for Reintroductions and Other Conservation Translocations. We have very thoroughly assessed the potential impacts on protected site features and existing wildlife. We have discounted any adverse impacts through direct predation and disturbance by the eagles or indirectly through increased visitor pressure from ‘eagle tourists’. We have carefully examined the potential risk of lamb predation. There is no evidence of this becoming a problem where the eagles live alongside lowland sheep farming in Europe. However, we will ensure that the applicant puts in place clear routes to identify and manage any unexpected issues that might arise. The licence permits the release of up to 60 eagles (12 per year) over the next five years. Young eagles will be sourced under licence from nests in Scotland and raised through to release on the Isle of Wight. The first release is planned for summer 2019. Natural England is pleased to be able to license this application. As described in the Government’s 25 Year Environment Plan, bringing back lost species in a well-planned and supported way not only helps wildlife populations recover, but can also help more people connect with nature and open up new business opportunities. Great news. Would you now have the confidence to see through the Suffolk reintroduction project that NE proposed 10+ years ago? Un bloody believable ! Taking Scottish chicks from a small newly established population to release them in a changed habitat from that which they once inhabited hundreds of years ago, now totally unsuitable, Why not try wales or the lake district, even they are very very different habitats from when they bred there. Put the time and money into supporting and encouraging them to prosper in Scotland instead. A huge waste of money time and resources in my opinion, doomed to failure at the expense of 50 young Scottish eagles. A sad day. Really unbelievable? They have already spread naturally to The netherlands which is more densely populated than the UK. The landscape has changed there too and is characterised by intensive livestock rearing and crop growing. If we were a little closer and did not have the Channel between us it might already have moved in here, and may in fact one day do so. Sea eagles already visit in Winter and have been seen in various counties in eastern England this year. If the Sea Eagle stays here of its own accord it must find our landscapes to its liking. Continental Europe is showing that even modern environments can host predators. Sea Eagles are expanding and wolves which have reached the ouskirts of Rome and Bologna and Golden jackals have proven that they can can live unobtrusively in densely populated countries close to people. Others species which have been assisted by man include boars and beavers, the majority of the latter In England anyway in enclosures, and the latter in particular have shown that they have beneficial effects not just for invertebrates fish and otters but also in providing potential solutions to floooding and droughts in summer. In the case of the latter we should thank DEFRA and natural England and thanks are in order also in this case but my point here is to remind critics that the Uk has the potential to host a great variety of creatures that are absent because of persecution, not because of any deficiency in the habitat. In my view you are also misleading readers with your comments on the small population in scotalnd. There are now a hundred and fifty pairs and some projections suggest the population could rise to more than 300 there, without taking into account the rest of the UK, many regions of which will be just as good habitat for these birds. A licence has been issued to take birds because the authorities are convinced there will be no deleterious effect on the host population. You repeat the idea that Britain has not had Sea Eagles for centuries. The last ones were shot 150 years ago. At that time forest cover, just one index of habitat quality was lower than it is now. Recent decades have also seen investment in wetlands and we now stand at a crossroads where new habitats will be created to offer wildlife a home. Finally you mention taxes. I was not aware that tax payers would be paying for this scheme. The Roy Dennis Foundation had to prove it was sufficiently well-resourced to finance this project, so I do not think you and I will be putting our hands in our pockets unless we decide to support the foundation. Perhaps you would, on this note, be distressed to hear that you as a tax-payer have been financing the killing of eagles, hen harriers and mountain hares on those grouse shooting estates eligible for agricultural support grants? Money does matter though. In Scotland business have been set up showing visitors white tailed eagles. Busineses pay taxes and therefore contribute to the well being of those communities. The key, of course, will be to manage interest in the eagles so that the environment, the eagles, and the local ppopulations are not adversely affected. I am so sorry this has been approved, and am convinced it will do more harm to our already struggling wildlife. The Roy Dennis Foundation are not entirely honest in their claims. One being that 85% of local people are in favour of this scheme, I suggest the figures would be nearer 85% against. I tried to leave my thoughts on one of their website "Forums" and it would not display it. I had not used bad or strong language, or anything that could be construed as aggressive, just as this e mail is, a negative response to this scheme. (Try it if you don't believe me). These magnificent birds are apex predators and will have nothing to stop them breeding until their food supplies run low, diminishing our already endangered wildlife, which in the words of The Hampshire and Isle Of Wight Wildlife Trust is in "Freefall." This is a situation in freefall virtually from the soil and insects upwards. I am convinced that in 10 years the brown hare will be extinct in this country, these eagles will accelerate this disaster. And now you approve of a scheme which is meddling with this troubled system, and I am left wondering what species you so called experts think will benefit from this? The answer of course and as always is "Us." No other species will benefit, but it is argued it will improve the local economy, so there we have it. I am depressed not only by the decision to allow this to happen and cause our wildlife more harm but also that my taxes are paying for the terrible mistake you have made in allowing this. Well of course you would say that a huge majority are against it. Why s hould people, apart from the NSA who are not slow to announce their displeasure, and those of nervous disposition who have not read about the rise of the sea eagle in other contexts, be against it. I think if the facts are made available the vast majority of people will be enthusiastic. Our landscapes can support many species that are now extinct and which can only be brought back by people with vision supported by painstaking research. On the continent people are accepting the natural spread of predators close to urban areas (sea Eagles wolves and golden jackals) with open minds and a willingness to share the land we occupy, knowing that with a modicum of good will any problems that arise can be solved. It is a mistake to think that Sea Eagles hark back to an Elysian past. They were breeding in England at a time when forest cover was lower than it is today and when many food resources were less plentiful. Sea Eagles are generalist hunters and the whole of England is swarming with Canada geese, whose young they take, carrion from the thousands of pheasants that are squashed into the asphalt by cars every year, and fish and I would not be surprised if they frequent rubbish dumps as gulls and herons do. I think we will find you that the small numbers that nest on the Isle of Wight will then spread throughout the south coast, bringing a feel of the wild to the lives of people who live their lives in simplified and in places soul-destroying environments. Like the common cranes that have been released in Somerset they may also inspire landowners and public authorities to manage land more kindly for the benfit not just of wildlife but people too. I do not think sea eagles will make a dent in hare populations and clearly the authorising body did not think so either. Remember that they turned down the application to reintroduce the lynx in Kielder Forest because, among other things, a convincing study of the impact of the animals on livestock and wild species had not been advanced. The problems faced by hares need to be adressed, and it may well be that habitat improvements designed to help eagles might also help hares. This is a very bold initiative and just what we need at a time when landed and farming interests often stand in the way of progress. I really hope you are right David and I am wrong, but I remain unconvinced by the arguements put in favour of these eagles. Are you sure forest cover was less in the past? I was under the impression Britain was far more forested, with smaller fields, hundreds of miles more hedges, more insects, mammals, amphibeans, birds and not the reliance on chemicals. By forest, I don't mean the barren woodland conifers create, I was thinking we had much more in the way of oak etc. I'm not sure what you mean about "People of a nervous diposition," if it means I am nervous of interfering with a system that we desperately need to put right, and are going the wrong way about it, then yes I am very nervous. I think there s a great deal of evidence available to allay the fears of those who are worried the eagles will have an impact on livestock and other native species. And yes there has been a great deal of planting in Britain, until the recent pause, much of it admittedly plantation woodland, some of which has been redeemed by planting with broadleaves along the edges as the Forestry commission has softened its approach to harvesting and species mixes. Further coniferous woodland has been slowly changed back to broad-leaved woodland by conservation organisations. You are right there were once more hedgerows and farming was less industrial certainly when the last eagles died in the early 19th century (sorry I got the dates wrong in my previous reply) but recent years have seen some of the great wetland losses recouped by campaigns to restore wetlands for bittern, which have created regional concentrations of wetlands which have also helped marsh harriers, cranes and pioneering little, great white, and cattle egrets along with little bitterns and purple herons. These are also full of coot and mallard which are often preyed upon by Sea Eagles. 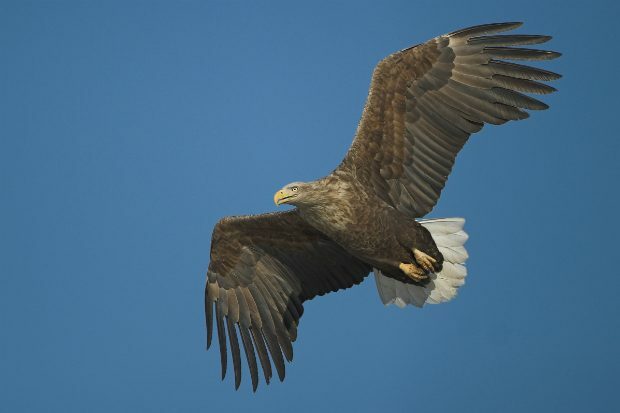 The main thing to emerge from Sea Eagle expansion in western Europe is that despite the clear overall degradation of the environment the eagles can still thrive in modern agricultural and coastal landscapes, flying inland to catch fish at inland lakes and reservoirs. I have always felt that the I O W and several other places in England could hold Sea Eagles but I have been thrilled to read others talking about habitat improvements which have been made there and the general buy-in to the project by the local population. Does their testimony here reassure you that not only will the eagles fit into the landscape but also raise environmental awareness to such a degree that further enhancements will be forthcoming? Eagles, in brief could well add to the landscape and the life of local people as they have in other places where they have become common again. I am sorry didn't realise we were on planet Zog where people and the economy come before nature. A rapidly shrinking nature as a result of population increase. Natural England are employing double standards and misinterpreting the IUCA guidelines. There is absolutely no conservation benefit to be gained from this introduction. It is NOT a re-introduction. There is no definitive evidence that a WTE ever nested at on the Island. There is a note of an abandoned nest containing a baby eagle but it was not identified. ON the famous red list White Tailed Eagles are recorded as "Least at Risk"
You are right Angela about money always coming frst, it seems to be the only positive that the scheme can offer. "A benefit to the local tourist industry." I have tried asking what other species other than us will benefit, but of course there isn't another species that will benefit. Angela, I think there is definite conservation benefit in restoring the Sea Eagle to what is widely regarded as being its last breeding site in England - Culver Cliffs. From there it will spread out to occupy territories occupied in the past. The Sea Eagle is celebrated in chronicles which describe how after battles sea eagles and ravens would arrive to scavenge the remains and its spread throughout Britain will help it to link up with populations in other parts of Europe. That is a conservation gain for Britain with English populations in the fulness of time linking up with the growing population in Scotland. I do not think the fact that the eagle is prospering generally is a reason for not introducing it. It is no longer in England not because the habitat does not support it but because it was exterminated by man. We a re in my opinion morally bound to bring it back. I am surprised how many people here have not read or do not trust the ample literature on the feeding habits of Sea Eagles. What are the native animals which will be eliminated or seriously affected by their return? The application considered the potential threat posed to red squirrels and on the basis of experience in Scotland and elsewhere concluded that the eagles are too cumbersome and not equipped to take such nimble prey. WTSE will take coot and mallard, young geese and other water birds and also mullet as well as carrion. These are common species and will not be be endangered by the eagles. The application for the birds to be reintroduced produced ample evidence from a wide range of sources to show that the eagles should not have an impact on wild species or on livestock but that should problems occur a strategy is in place to resolve matters. These safeguards were accepted by natural England which has not been the most adventurous organisation with regard to reintroductions so we can rest assuraed a very strong case has been made. The danger of introduced species affecting native wildlife recalls the problems arising from the arrival of alien species such as red squirrels, signal crayfish and muntjac. You will know that these were introductions as these animals had never bred here before and that they were not subject to the intense scrutiny which now accompanies reintroduction applications . On the contrary well-planned reintroductions that is the careful return of animals that once lived here but have been exterminated,following IUCN guidelines, which err on the side of caution and severity have been very successful and restored important species to nature impoverished Britain. Red kites have been a great success story and common cranes great bustards and large blue butterflies are other examples of species once again returning to our countryside, to the delight of both naturalists and casual visitors to the countryside. The case of the common crane brings up another positive consequence of reintroductions that you have not considered. The focus on creating ideal habitat helps other species too. Cranes like marshes and reedbeds. So do reed buntings and reed and sedge warblers, which increase in number as more habitat is created. Sometimes reintroduced species create their own habitat which is then colonised by a wide range of other species. Beavers are now being reintroduced under more or less controlled conditions in various parts of the country. The ponds and channels they create are perfect for invertebrates, fish, birds, butterflies otters and water voles as well as reducing flooding downstream, removing pollutants from water and maintaining water flows in summer. Reintroductions also help nature because the animals that have been long missing perform important roles in the ecology of the places they inhabit. We have spoken about beavers - we could just as well talk about the role boar have in helping herbs and other plants germinate and looking to the near future the possibility thay Lynx will once again help control the numbers of roe deer. Tourism will certainly help people make their livings but the return of iconic species will also foster in local people a pride and a determination to protect not just those new species but nature in general. If you re-read some of the posts in favour of the return of the WTSE you will note that they refer to environmental improvements that have been made recently and others that will transpire partly through the impetus provided by this great news. After so many decades of decline we are now about to witness, at least in part the restoration of a certain complexity to the web of life, an enriching of natural communities and renewed hope for those who are inspired by the wildness and majesty of these enormous but adaptable birds. John - can you direct me to the website 'Forum' you refer to? There was a public questionnaire hosted by an independent app that can't be manipulated. As a resident I attended the public consultation events and it was quite clear that the vast majority of people were enthusiastic. I am on several island Facebook groups where this has been discussed very actively, and can report at least 80% support. The Survey Monkey poll revealed 85% support. Rob- The Government's 25 Year Environment Plan commits to a set of actions, including guidance and codes, to help steer what species and where might be suitable for future proposals. We will continue to take a rigorous and evidence-led approach to all proposals, as demonstrated by recent advice and decisions on beavers, lynx and white-tailed eagles. Keith & John- all of the concerns you raise were very carefully considered during our assessment. The applicant will be required to have a through monitoring and evaluation programme, so interventions can be made should unexpected issues arise. Eagles will be removed from Scottish nests under a separate SNH licence and that will safeguard from any impact on the donor population. Again this was carefully considered during our assessment, with advice from relevant experts. Finally, this project is not taxpayer funded and Natural England is contributing no funds. The licensee has raised their own funding for the project. I never even heard a buzzard until 2002 or so in the Isle of Wight. Now I hear and see lots even in Kent. (Is that where all the rabbits went?) I hope the eagles do that well too. The natural state of the wildlife population is being tipped by man ! As an Isle of Wight resident I can report a huge amount of support for this project, and enthusiasm to get stuck in. Eagles will be safe here, and we look forward to building new nature-based enterprises around enjoying eagles and all the other amazing wildlife on the island. The habitat here is perfectly suitable and we will take action to make it even better. We're delighted that NE respected the 85%+ support expressed during the excellent public consultation exercise. And I have talked to several farmers keen to set up watch points, possibly renovate old buildings for visitor accommodation etc. Land owners keen to show people eagles will also be incentivised to create habitats for other wildlife on their land, so they can increase the attractiveness of their land for visitors. That's one way in which eagles will help other wildlife. And our countryside is a lot less intensively managed than areas in the Netherlands with increasing eagle populations. So, than you, Natural England - we'll embrace eagles on the island and ensure this project is a great success. This comment underlines the comments that I have been making. Releasing these eagles on the Island has nothing to do with the welfare of our struggling existing wild life, just the fact that people may benefit financially and it will be an impressive sight to see these large birds flying around. Just some one please explain to me what species other than us will be helped by these apex predators. I still don't know where 85% of Islanders who approved of the scheme are. All the people I have spoken to, including The Red Squirrel Trust are not in favour. John, read what Steve and others have said a little more carefully and you will see that the environment will improve with Sea Eagles. Farmers showing them to visitors will manage their land less intensively, putting in ponds and shelter belts, spinneys and hedgerows. This will benefit flora, insects, birds mammals, reptiles and amphibians. Before long you will also have ospreys as they start to spread from their translocation sites on Poole harbour. I think you will be amazed at how local wildlife will benefit. This is very disappointing and shows scant regard for the many endangered species that up until now have found valuable sanctuary on the Isle of Wight. Globally, introductions/re-introductions have been disastrous for resident wildlife which already struggles with a hostile environment.